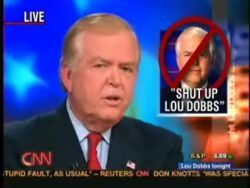 There has been a movement by some folks to boycott Lou Dobbs, because he has given airtime to supporters and opponents of the theory that President Obama was not born in Hawaii. Such boycotts rarely are effective, because most viewers are not one issue. However, CNN is generally liberal and too often PC. You would think that Fox News would be a target of overly excited liberals, not CNN. Perhaps, there has been a movement to squash Fox. If so, it has been a failure.